Makai Khichdi, also known as Makai Chivda, is a popular dish in many Gujarati homes. Rich with spicy and sweet flavours, which is very typical of Gujarati cuisine. This vegetarian snack tastes excellent when prepared with seasonal tender corn. Recipe is from the kitchen of Saroj Ben Desai, a great grandmother from Bangalore. Shear the top layer of the corn niblets with a sharp knife. Now grate the remaining niblets. This way you will get a mixture of corn niblets and grated corn which will lend a crunchy taste to the dish. If the corn is not tender, then steam the mixture (preferably by pressure cooking without adding any water) before proceeding with the next step. Heat oil in a heavy-bottomed wok and add mustard seeds. As the mustard begins to pop, add the sesame, cashew nuts and red chilli. 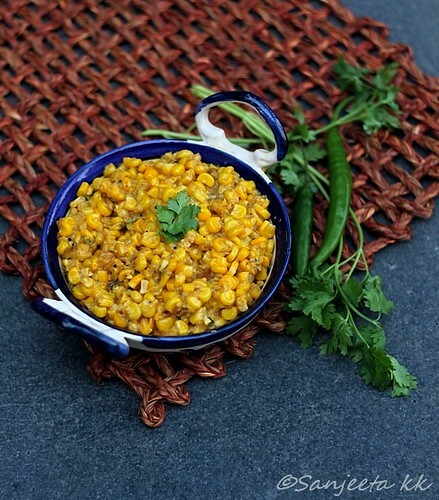 As the cashew nuts turn golden, add the asafoetida powder, green chillies and grated corn. Cover and cook for 10 minutes without adding any water. After 2-3 minutes, add the sugar and lemon juice. Cook for a few more minutes until the oil comes on top. A family favourite in the Desai home, this is served as a breakfast dish, an evening snack or as a side-dish in a meal. If the dish has to be reheated and has become thick, you may add a tablespoon of milk before heating it. This recipe was first published in The Great Granny Diaries – a column in Harmony Magazine. Part-1 of this post is the interview with Saroj Ben Desai, a Gujarati great-granny from Bangalore.